Overview of the Hotel: Located in central Hamburg, just 200 metres from the St. Michaelis Church, this hotel offers large studios, a stylish bar, and a restaurant serving international food.Free use of the Meridian Spa until 12:00, is provided to all the guests. A swimming pool, a fitness centre and Japanese garden are included in the spa. A fully-equipped kitchenette, satellite TV and high-speed internet access are included in all the rooms.Breakfast, European dishes and Asian food are served in the hotel’s restaurant. Cocktails, fine wines and a large summer terrace are offered in the bar. Amenities at the Hotel: Restaurant, Bar, 24-Hour Front Desk, Newspapers, Terrace, Non-Smoking Rooms, Rooms/Facilities for Disabled Guests, Elevator, Express Check-In/Check-Out, Safety Deposit Box, Soundproofed Rooms, Heating, Luggage Storage, Allergy-Free Room Available, Airconditioning – are some of the facilities provided. Other facilities include – Room Service, Meeting/Banquet Facilities, Business Centre, Laundry, Dry Cleaning, Ironing Service, Bridal Suite, Currency Exchange, Shoe Shine, Packed Lunches, Tour Desk, Fax/Photocopying, and Ticket Service. Sauna, Fitness Centre, Solarium, Spa & Wellness Centre, Massage, Jacuzzi, Turkish/Steam Bath, Indoor Swimming Pool – are provided to entertain guests. Wired internet is available in the hotel rooms and is free of charge. Public parking is possible on site (reservation is not needed) and costs EUR 14 per day. Hotel Rules: The Check in time for the hotel is from 15:00 hours and the Check out time is until 12:00 hours. Cancellation and prepayment policies vary by room type. All children under 2 years stay free of charge for cots. All children from 12 to 18 years are charged EUR 20 per night per person for extra beds. All older children or adults are charged EUR 20 per night per person for extra beds. Maximum capacity of extra beds/babycots in a room is 1. Pets are allowed on request. Extra charges may be applicable. American Express, Visa, Euro/Mastercard, Diners Club– are all acceptable. The hotel reserves the right to pre-authorize credit cards prior to arrival. Overview of the Hotel: Located in Hamburg’s Fleetinsel area at just a 5-minute walk from the lovely Alster lake, the Steigenberger Hotel is also in close proximity to St. Michel church, which is just an 8-minute walk away. The hotel offers gourmet food and free use of the exclusive spa with panoramic views. 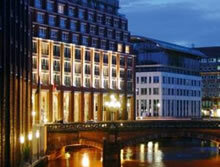 The spacious rooms and suites of the Steigenberger Hotel Hamburg provide scenic views of the city or canal. Wi-Fi is available in all areas. The Steigenberger’s 6997 ft² DaySpa includes a panoramic sauna and gym with rooftop fitness area. Ayurvedic treatments are offered here. The Steigenberger Hamburg’s Calla restaurant serves fine international food. Other facilities include the Bistro am Fleet and the classic piano bar. Amenities at the Hotel: The facilities at the hotel include Restaurant, Bar, 24-Hour Front Desk, Newspapers, Terrace, Non-Smoking Rooms, Rooms/Facilities for Disabled Guests, Family Rooms, Elevator, Express Check-In/Check-Out, Safe, Soundproofed Rooms, Heating, Baggage Storage, Air Conditioning and Designated Smoking Area. The guests can enjoy at the Sauna, Fitness Center, Solarium, Spa & Health Club, Massage and Turkish/Steam Bath. Other services include Room Service, Meeting/Banquet Facilities, Laundry, Dry Cleaning, Hair/Beauty Salon, Breakfast in the Room, Ironing Service, Currency Exchange, Bicycle Rental, Shoe Shine, Packed Lunches, Tour Desk, Fax/Photocopying and Ticket Service. Wi-fi is available in the entire hotel and costs EUR 15.50 per 24 hours. Private parking is possible on site (reservation is not needed) and costs EUR 20 per day. Hotel Rules: The Check in time for the hotel is from 15:00 hours and the Check out time is until 12:00 hours. Cancellation and prepayment policies vary by room type. All children under 12 years stay free of charge when using existing bedding. All children under 2 years stay free of charge for cots. All older children or adults are charged EUR 44 per night per person for extra beds. Maximum capacity of extra beds/babycots in a room is 1. Pets are allowed on request. Charges may be applicable. Accepted credit cards are American Express, Visa, Euro/Mastercard, Diners Club, JCB, and Maestro. The hotel reserves the right to pre-authorize credit cards prior to arrival. 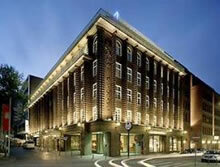 Overview of the Hotel: Located in the centre of Hamburg it’s just a few minutes walk from the Alster Lake. All its rooms and suites have air conditioning, a minibar, satellite TV, Wi-Fi and nostalgic black-and-white photos. Spacious accommodations, regional gourmet cuisine and a historic façade are provided by it. Its restaurant provides a buffet breakfast with Northern German specialties. Tea, drinks and bar snacks are served by The Bricks lounge. Live music or a live DJ provides free entertainment every Wednesday. 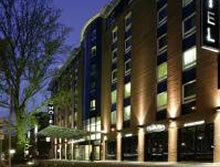 Gym, pool and sauna at the nearby Hamburg Marriott can be used by the guests without any extra cost. 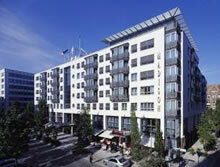 The hotel’s location is such that it provides easy conveyance to its guests. Its just a few minutes away from The Jungfernstieg underground station. The Dammtor intercity railway station and CHH exhibition centre are also close by. Amenities at the Hotel: Restaurant, bar, 24-Hour Front Desk, Newspapers, Non-Smoking Rooms, Rooms/Facilities for Disabled Guests, Elevator, Safety Deposit Box, Heating, Luggage Storage, Air-conditioning – are some of the facilities provided. Other facilities include – Room Service, Meeting/Banquet Facilities, Business Centre, Babysitting/Child Services, Laundry, Dry Cleaning, and Breakfast in the Room, Currency Exchange, and Fax/Photocopying. Wi-Fi is available in the entire hotel and costs EUR 12.50 per 24 hours. Wired internet is available in public areas and is free of charge. Private parking is possible on site (reservation is not needed) and costs EUR 25 per day. Hotel Rules: The Check in time for the hotel is from 16:00 hours and the Check out time is until 12:00 hours. Cancellation and prepayment policies vary by room type. All children under 12 years stay free of charge when using existing bedding. All children under 2 years stay free of charge for cots. All older children or adults are charged EUR 24 per night per person for extra beds. Maximum capacity of extra beds/baby cots in a room is 1. Any type of extra bed or baby cot is upon request and needs to be confirmed by the hotel. Supplements will not be calculated automatically in the total costs and have to be paid separately in the hotel. Pets are allowed on request. Charges may be applicable. American Express, Visa, Euro/MasterCard, Diners Club – are all acceptable. The hotel reserves the right to pre-authorize credit cards prior to arrival. Overview of the Hotel: Located in the quiet Hamburg district of Nord Altona, The NH Hamburg Altona hotel features offers creative international food, Wi-Fi in all rooms, and easy transport links to the city centre.Its large rooms are air-conditioned and feature black-out curtains, satellite TV, and dark wood furnishings.A steam room, Finnish sauna, and a beauty studio are included in its spa area. the panoramic sun deck is another place where the guests can relax. Its restaurants serve relishing food including seasonal food and Hamburg dishes. a terrace and large TV are found in The Navarra bar. Its location is such that the main train station is just minutes away and the A7 motorway is also only 2 km away. The Bornkampsweg bus stop is opposite to this hotel. Amenities at the Hotel: Restaurant, bar, 24-Hour Front Desk, Newspapers, Garden, Terrace, Non-Smoking Rooms, Elevator, Express Check-In/Check-Out, Safety Deposit Box, Luggage Storage – are some of the facilities provided. Other facilities include – Room Service, Meeting/Banquet Facilities, Business Centre, Laundry, Dry Cleaning, VIP Room Facilities, Breakfast in the Room, Ironing Service, Currency Exchange, Shoe Shine, Packed Lunches, Tour Desk, and Ticket Service. Sauna, Fitness Centre, Solarium – are provided to entertain guests. Wi-Fi is available in the hotel rooms and costs EUR 10 per hour. Public parking is possible on site (reservation is not needed) and costs EUR 10 per day. Hotel Rules: The Check in time for the hotel is from 15:00 hours and the Check out time is until 12:00 hours. Cancellation and prepayment policies vary by room type. All children under 2 years stay free of charge for cots. All older children or adults are charged EUR 35 per night per person for extra beds. Maximum capacity of extra beds/babycots in a room is 1. Any type of extra bed or baby cot is upon request and needs to be confirmed by the hotel. Supplements will not be calculated automatically in the total costs and have to be paid separately in the hotel. Pets are allowed. Charges may be applicable. American Express, Visa, Euro/Mastercard, Diners Club, JCB – are all acceptable. The hotel reserves the right to pre-authorize credit cards prior to arrival.